This baked bacon ranch chicken is the ultimate easy dinner option! It’s crispy, cheesy and full of flavor! Baked ranch chicken is the perfect easy meal that your whole family is sure to love. Best of all, there’s only 10 minutes of prep time involved which makes it perfect for a busy night. 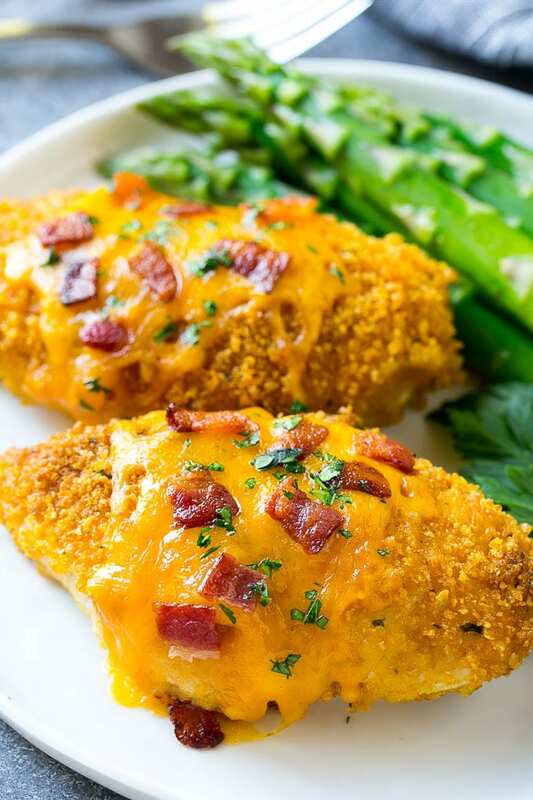 Your whole family will request this bacon ranch chicken again and again! At my house, you’ll almost always find chicken on the dinner menu. 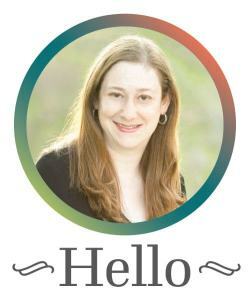 It’s inexpensive, convenient and my kids prefer it. Sometimes we get tired of the same old chicken which is why I decided to shake things up a bit with this bacon ranch chicken. 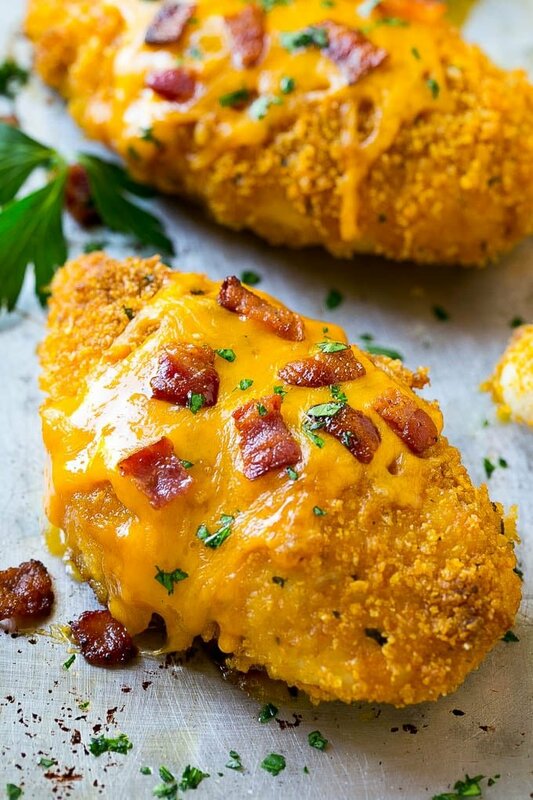 This super delicious baked ranch chicken is coated in a ranch cornflake crust, baked to crispy perfection, then topped with cheese and bacon. 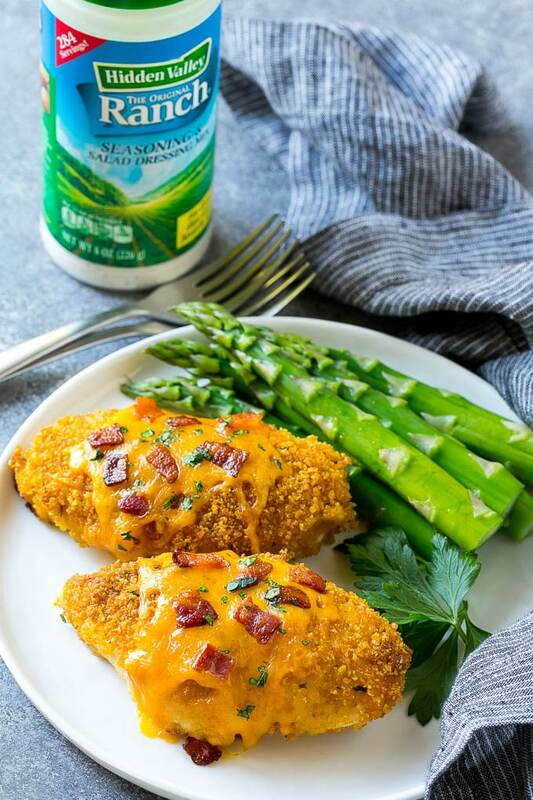 Dinner time will never be boring again with Bacon Ranch Chicken with Hidden Valley Ranch®! This recipe starts with cornflakes, which can be crushed by hand with a rolling pin or in a food processor. The cornflakes are combined with ranch seasoning for maximum flavor. Chicken breasts are dipped in butter, then rolled in the seasoned cornflakes and baked. At the very end of the bake time, I add a bit of shredded cheese and some crispy bacon. Add a sprinkling of parsley and dinner is served! I use cheddar cheese here, but you can use any cheese that you like. 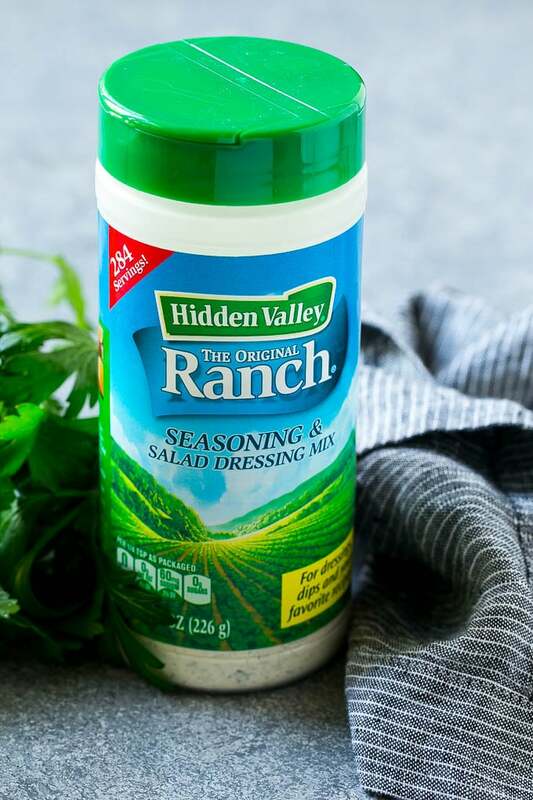 I use my Hidden Valley® Original Ranch Seasoning & Salad Dressing Mix shaker to season the cornflakes. This shaker bottle is SO convenient, I always keep one in my pantry. You can shake or spoon your ranch seasoning to add tons of flavor to any savory dish, I like to add it to popcorn, meat, garlic bread, french fries, you name it! My kids adore this seasoning too, they love a sprinkle over their veggies at dinner time and I love that it is made with no artificial preservatives. I buy my shaker at Walmart, it’s available in the salad dressing aisle. 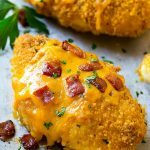 You can pick up all the ingredients you need for this bacon ranch chicken at Walmart, it’s my favorite store for easy dinner time solutions. The cornflake crust will naturally crisp up in the oven as it bakes. The chicken will release juices as it cooks, which means that the top of the chicken will be crispier than the bottom of the chicken which is sitting directly on the pan. To get bacon ranch chicken with a crispy bottom, you can bake it on a rack that’s been coated in cooking spray. This will ensure crispy chicken all around! That being said, if you don’t have a rack or don’t want to use one, the baked ranch chicken is still absolutely delicious when baked directly on the pan. I like to serve this bacon ranch chicken with a side of asparagus or roasted potatoes. You can simply add your potatoes to one side of the pan and they cook right along with the chicken! Other great side dish options are green beans, mashed potatoes, brussels sprouts and butternut squash. When you’re looking for something a little different for dinner, be sure to head over to Walmart and grab all the ingredients for this baked ranch chicken, your family will be so glad that you did. Check out the Walmart website for more amazing ranch recipes to make meal time easy and effortless! This baked bacon ranch chicken is the ultimate easy dinner option! It's crispy, cheesy and full of flavor! Preheat the oven to 400 degrees. Coat a baking dish or sheet pan with cooking spray. Place the corn flakes and ranch seasoning on a plate and stir to combine. Place the butter in a small bowl. Dip each chicken breast in the butter then coat in the corn flake mixture. Season the tops of the chicken breasts with salt and pepper to taste. Place the chicken in the prepared dish. Bake for 35 minutes. Sprinkle the cheese and bacon evenly over the tops of the chicken breasts. Return to the oven and bake for an additional 5-7 minutes or until cheese is melted. I am putting this on my dinner plans for the week ahead. Love that it can be crispy but still baked and not fried. This looks so amazing! Who doesn’t love ranch and bacon?! Yum! I’m a sucker for crispy baked chicken!! This looks amazing. What an awesome way to jazz up chicken breasts! This looks super tasty! What a flavorful and yummy chicken dish! My family would love it for sure.